By Joshua Benton @jbenton March 25, 2019, 6:40 p.m.
Apple announced its much-anticipated premium news service today. It’s called…Apple News Plus? Apple News+? News+ seems to be the official branding (a shift that began in iOS 12.2 beta 4), but the  character doesn’t show up on most non-Apple devices, so let’s go with Apple News+. (Ugh, that “+.” is ugly+. Make it Apple News Plus.) You can watch the keynote here; the Apple News part starts about 6:30 in. In addition to all those magazines, Apple News Plus will include some content from a few non-magazine publishers. In newspapers, that’s The Wall Street Journal and the Los Angeles Times. From the digital natives, that’s three brands from New York magazine (Vulture, The Cut, Grub Street), a new product from Vox (The Highlight), TechCrunch’s subscription product Extra Crunch, and The Skimm. That’s…it, as far as we know. It’s pretty evident that Apple doesn’t consider the newsier part of the package all that critical to the bundle. 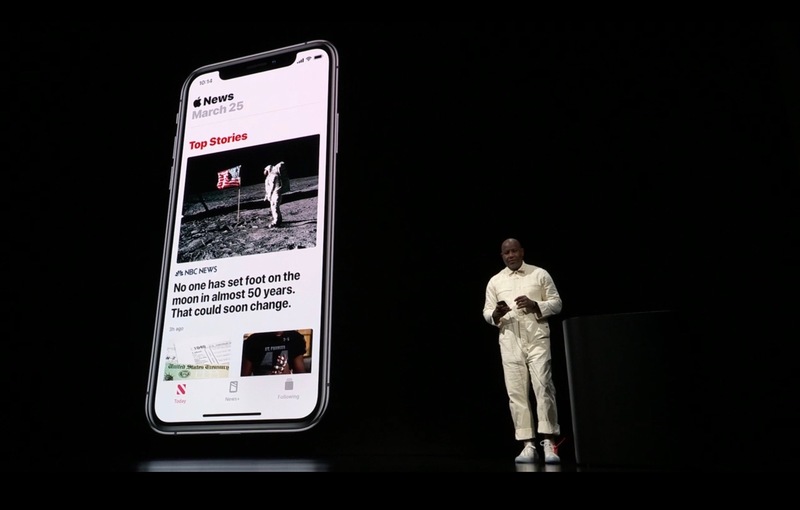 Based on the timestamps at The Verge’s liveblog, Apple spent a total of 17 minutes and 20 seconds talking about Apple News Plus — and only 1 minute and 10 seconds of that were spent on the non-magazine content. The cost is, just as it was in Texture, $9.99 a month. (Though if you pay with it for the new Apple Card, er, Card, you’ll get 20 cents back!) Apple CEO Tim Cook said that to subscribe to all of these publications individually, you’d have to pay $8,000 a year, so what a deal! Which is mathematically true, but not many people are paying for ABC Soaps in Depth and All About Beer and Birds & Blooms and Canadian Cycling and Cottage Life and Cruising World and Deer & Deer Hunting and Diabetes Self-Management and Family Handyman and Fit Pregnancy and Baby and Gluten-Free Living and Golf Tips and HELLO! Canada and Journal of Alta California and L’actualité and Marlin and Midwest Living and Parents Latina and Popular Woodworking and Salt Water Sportsman and Sport Fishing and Successful Farming and The Pioneer Woman and Truck Trend and Wood and Yoga Journal to begin with. So it’s a difficult comp. But there are no companies with greater capacity to do good for both the news industry and the state of news consumption than Apple and Google. They control the operating systems that we spend countless hours staring at and getting information from. When Google decides to show users more news, it works — fast and at scale. When Apple decides to make a News app, it drives a lot of news to people who wouldn’t otherwise have seen it. And because Apple’s customers are the most attractive for news organizations — they on average have more money and consume more news — what they do with paid content matters even more. Texture was built by a consortium of magazine companies (Condé Nast, Hearst, Meredith, Time Inc.), originally under the name Next Issue. It was meant as a way for those magazine giants to make sure that they would be able to control the means of distribution for their products and not let a tech giant like Apple take charge of it. But even for magazines, only a relatively small share of the work they produce today finds its way into an issue. Take The New Yorker, which produces 47 issues of the magazine each year — but which can publish 47 digital-only stories over just a couple days. (If you want to read those in Apple News Plus, you get thrown out into a web browser, where you get the standard New Yorker paywall. Your “subscription” only goes so far.) Or Vanity Fair, a monthly magazine that has published 22 online-only stories including the word “Mueller” in the last week alone. Magazine companies wanted to sell issues — what unbundled industry has ever enjoyed the unbundling? — so that’s what Apple is hocking today. Texture currently gives you the contents of The New Yorker print magazine, for instance, but nothing from https://t.co/O9CLL4D92J. Same for every other mag. An "issue"-based product has business appeal but limited user appeal. If you ever rewatch the documentary Page One: Inside the New York Times (mostly filmed in 2010, released in 2011), there’s an entire section focused on the iPad as journalism’s savior, while smartphones get barely a glancing mention. It was a bad bet. Tablets have never risen much above 7 or 8 percent of all U.S. web traffic. Meanwhile, phones now generate the majority of web traffic at most American and European news sites. But it was in this moment of irrational tablet excitement that those magazine publishers joined forces to make what would become Texture. It was initially for tablets only; an iPhone version didn’t arrive until late 2013. And even then, Texture remained completely optimized for tablets — for magazine-sized pages, rendered in PDF, and shrunken to the phone screen in your hand. Some publishers made versions of their “issues” that could look okay on a phone, but most were content to turn the greatest content-consumption device created by mankind into a janky version of Adobe Reader. Next Issue is now @Texture. https://t.co/bonj85WUqD It’s like a Netflix-for-subscriber-flyout-cards. Benton, Joshua. "Apple News Plus is a fine way to read magazines, but a disappointment to anyone wishing for a real boost for the news business." Nieman Journalism Lab. Nieman Foundation for Journalism at Harvard, 25 Mar. 2019. Web. 24 Apr. 2019. Benton, Joshua. "Apple News Plus is a fine way to read magazines, but a disappointment to anyone wishing for a real boost for the news business." Nieman Journalism Lab. Last modified March 25, 2019. Accessed April 24, 2019. https://www.niemanlab.org/2019/03/apple-news-plus-is-a-fine-way-to-read-magazines-but-a-disappointment-to-anyone-wishing-for-a-real-boost-for-the-news-business/.